I’ve just finished reading the article Walking as Spiritual Practice: The Pilgrimage to Santiago de Compostela, written by Sean Slavin. His discussion on the discursive tools (e.g. maps, guidebooks, pamphlets and signage), which pilgrims use along the Camino de Santiago in Spain, prompted me to think about the discursive tools/objects that are employed along the Lurujarri Dreaming Trail. What were the ‘tools’ or ‘objects’ that told stories along the Trail? Had I asked this question a year ago I would have uncovered something very different; up until this year, the key discursive ‘tool’ predominantly used along the Trail was oral storytelling, with the focus being on stories from Bugarregarra – creation/the dreaming. 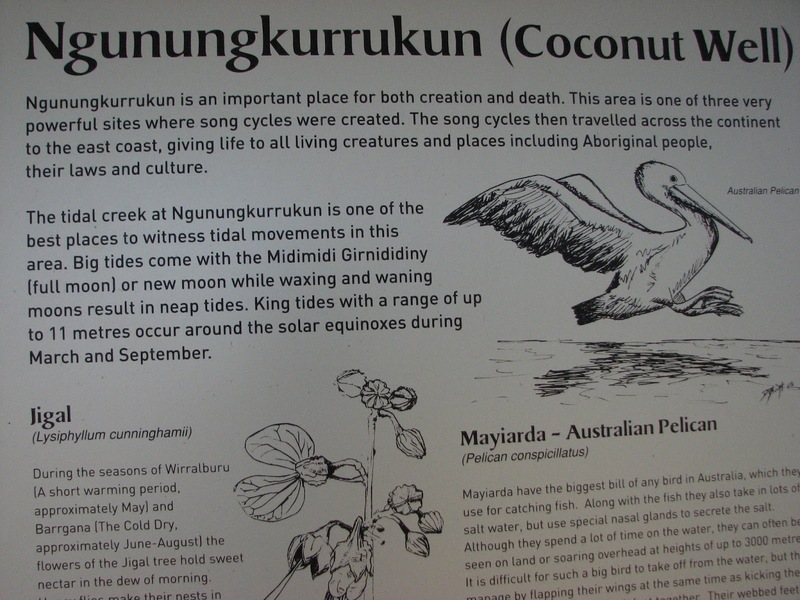 All my past experiences of walking trail were punctuated by the storytelling of Richard Hunter, Goolarabooloo law boss and Storyteller for the Northern Traditions Song Cycle. 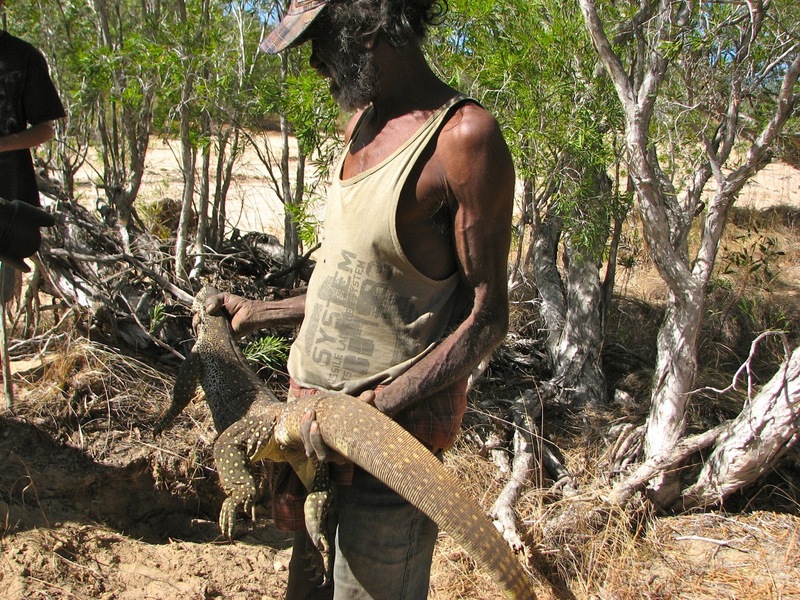 This is Richard on Trail last year with a big barney (goanna). Richard retired from the role of storyteller last year, creating space for the younger Goolarabooloo men to step into this role. 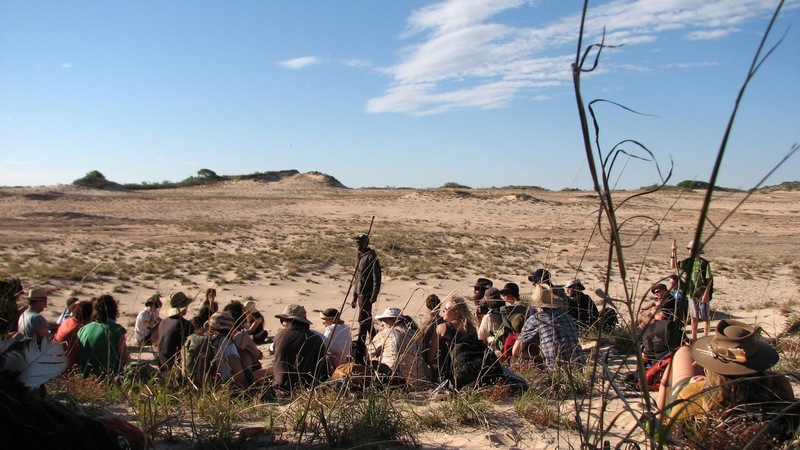 There were a number of Goolarabooloo men who shared stories with the walkers on Trail this year, but not without a visible reluctance (I think this was more about being shy and lacking confidence, underpinned by a deep respect for Richard’s authority as storyteller and teacher). I guess it is hard to step into someone else’s shoes after they have been doing something for a long time. As the first walking of the Trail progressed and ended and the next one began shortly after, the storytelling became more scant and the walkers of Trail more hungry… This hunger was visible in the way that people swarmed around interpretive signs at key locations along the Trail and hung off every word when a story about country was being shared in the process of walking. 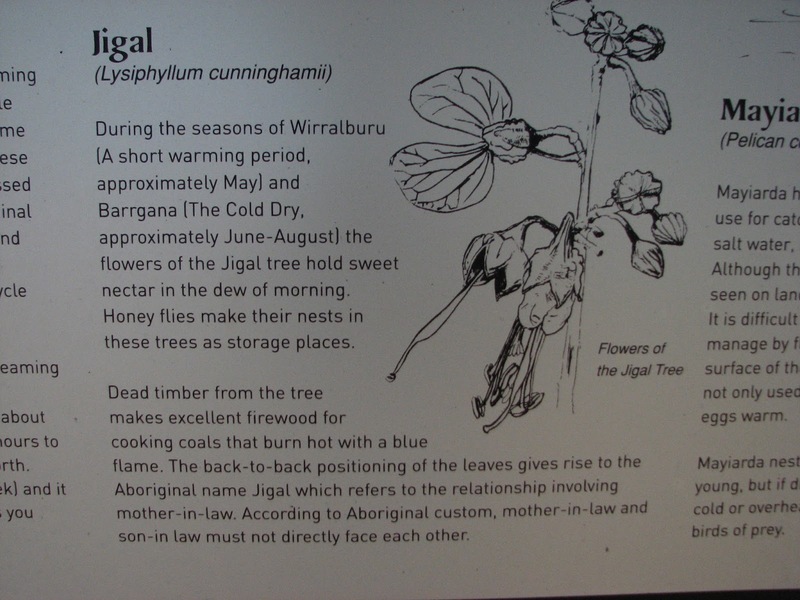 These interpretive signs share local Indigenous knowledge about country, including plants, animals, places and stories from Bugarregarra. Expectations of stories being shared by Goolarabooloo bubbled to the surface of conversations that Trail walkers were having amongst themselves. It became increasingly evident through the conversations that I had with other walkers that people wanted the country they were walking through to be storied; they wanted to see this country through the lens of Bugarregarra. At one point, a volunteer on the Trail unearthed a dilapidated box of old Lurujarri Heritage Trail brochures; they were received with great excitement by the walkers who were in the vicinity. Stories told through the brochures were poured over, words recited and then the brochures were filed away safely into journals and notebooks. It is important to note that these pamphlets were barely being held together; they were stained yellow with mildew and were torn along the folds. Miraculously, they had endured two decades worth of wet seasons in the Kimberely. 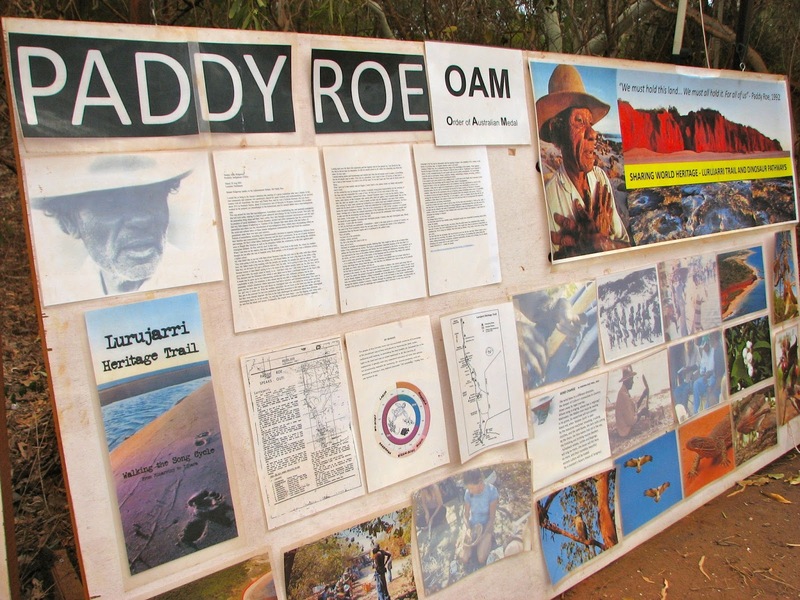 The other discursive object that we came upon during Trail was a large information board about past Goolarabooloo custodian Paddy Roe. Whilst Paddy’s descendants often make mention of him and the legacy which he created by initiating Trail, this information board (it contains images, a transcript from his obituary and an article in which he speaks about the Trail) gives Paddy a different agency on Trail. Standing at the board in front of his images, I feel a sense that I am having a moment with Paddy himself. It is hard to articulate why this is so. At the heart of this story about discursive objects and tools are the questions, how do we generate meaning about place and our relationship with place? What role do stories play in the interweaving of people and place? From 'Kara'I liked this and wonder if the big gonna is not a discursive tool, the tree which you spoke of to me, the artifacts found along the way- arrow heads, stone tools, crabs we ate. Are these not discursive tools that tell the story of the place?Just my thoughts, what do you think?